The Durban Fashion Fair (DFF), which is a proudly eThekwini Municipality initiative developed to grow the fashion industry in the city, as well as create a platform for employment and entrepreneurship opportunities, is now celebrating 7 years on the fashion calendar! Each year, the Durban Fashion Fair open up their doors not only for potential designers, but for aspiring models as well. DFF hosts an open casting for potential models within the Greater Durban area who are not registered with a modelling agency in order to offer them a platform to wear the creations of the designers invited to showcase their work. Thousands of hopefuls turn up over the two day process and the judges have to narrow it down after a rigorous selection takes place with just 10 male and 10 female potential models being selected. They are then put through an 8 week “model boot camp” where they receive instruction in all aspects of modelling, including techniques of walking the ramp alongside professional models, etiquette at photographic sessions, as well as how to keep fit and healthy – the focus being on functional training over the 8 weeks. 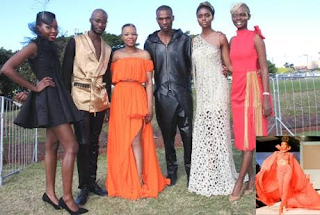 This year, 6 former DFF boot camp models recently showcased designer garments at the 2018 Vodacom Durban July (VDJ) Young & Invited designer categories presented by the Durban Fashion Fair which took place on Friday, 22 June. They also modelled garments at the recent VDJ on Saturday, July 7th. Xola Ndlovu (DFF 2015), Twinky Dimba (DFF 2015 female new face winner), Lavender Muchenje (DFF 2017), Sara Mngadi (DFF 2015); Samantha Jali (DFF 2017 New Face winner) and Olwethu Cele (DFF 2015 Male New face winner) all unanimously agreed that their experience gained through the model boot camp allowed them to realise the important aspects of what it means to be a professional model, and the hard work that is needed to succeed; from realising that success relies on a combination of genetics, professionalism, dedication, and sheer luck, believing in one’s self, and keeping fit and eating healthy. “We came from humble beginnings, but through the lessons learned at the DFF model Boot Camp we were able to persevere and if it was not for the advice given to us by the mentors, we would not be where we are today,” they all agreed. When asked what advice they would give the 2018 models who are about to commence their boot camp this month, they all said: “Attend each class; ask questions; keep on practicing & exercising when classes are not in session, but most of all have fun, as it is an exciting new world out there and it is up to us to grab these opportunities when and where we can”. According to Sindi Shangase the Business Support, Tourism and Markets Unit Programme Manager who spearheads DFF: “There is so much talent on our doorstep. I believe it is up to us and the team behind the Durban Fashion Fair to offer these platforms and provide opportunities relating to the fashion industry. Most of our models who have participated in our past boot camps have already started their professional careers with top agencies from around the country and have participated in many advertising campaigns for major clothing stores, appeared on various fashion show ramps around the country and some have done TV commercial work.” She wraps up by saying, “This makes us proud that the DFF has afforded these youngsters a platform to grow and we look forward to watching them take the modelling world by storm”.